Jonathan House of The Wall Street Journal has an interesting story in Friday’s paper about how a shortage of skilled workers is driving up wages in a handful of industries (oil drilling, trucking, home construction), even as overall earnings growth remains weak. [Thomas] Lyng, the trucker in Buffalo, was briefly wooed away from his current employer, Covenant Transportation Group Inc., with promises of higher pay by a competitor 2½ years ago. But he soon returned to Covenant for what he viewed as a better work environment and a lucrative retention program that offers annual bonuses and increases in per-mile rates for staying with the company. He said his earnings have risen by more than 10% a year since he arrived, to about $56,000 last year. “If you keep moving, you’ll make money,” the 51-year-old said. Earlier, House explains that demand for truckers is strong (in part because of regulations limiting the number of hours they can drive), and supply is limited (in part because of an aging workforce). So it’s no surprise someone like Lyng has gotten a few raises recently. But look at how he got those raises: by jumping between jobs. Job-to-job transitions like Lyng’s don’t get a lot of attention because they don’t change total employment numbers, at least not directly. But they’re hugely important as a source of productivity and, in particular, wage growth. That’s especially true for young people, who tend to bounce from job to job in search of better earnings. The trouble is, changing jobs also carries risks — What if your new boss hates you? What if you aren’t any good at the new job? What if your new company goes belly up? — which makes workers reluctant to switch jobs when the economy is weak. The government doesn’t track job-to-job transitions directly, but it does track voluntary quits, which are a pretty good proxy (most people don’t quit their job until they have a new one). 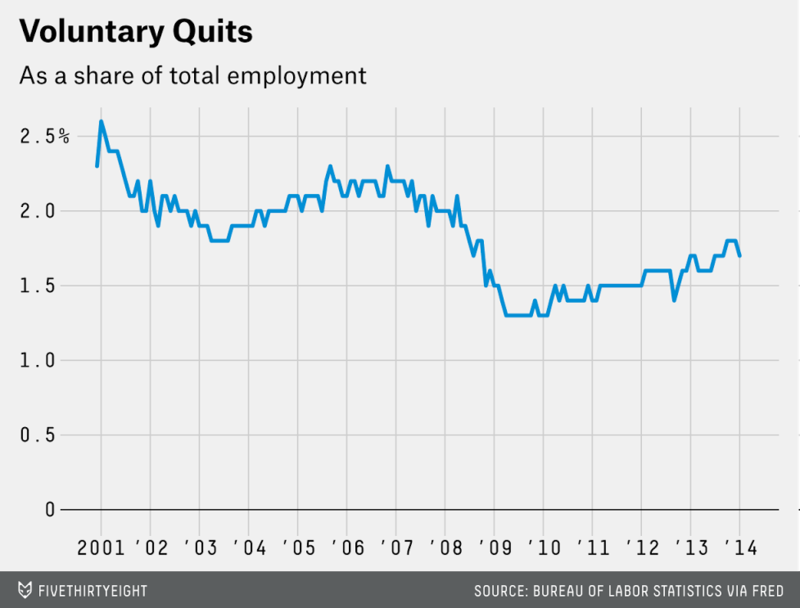 The number of quits plummeted during the recession and rebounded only slowly during the weak recovery. That may be one reason that wage growth has been so weak recently, especially for young people. Now, the number of quits is rising, which could help more people get raises. It could also have other benefits, opening up more opportunities for unemployed workers or new graduates to fill the jobs the quitters leave behind. But the rate of quits remains below its pre-recession level, and even further below the level of the early 2000s. Government data on quits doesn’t go back any further than that, but other measures suggest that job turnover has been trending down for even longer. On a macro level, that could suggest an economy that’s becoming less dynamic. On a micro level, it could mean fewer raises for people like Lyng.